Recently, I won a giveaway on another blog, Nuts 4 Stuff. I received a $25 gift code to 100% Pure Cosmetics. I have to tell you about one of the things I chose because it is my new favorite thing. 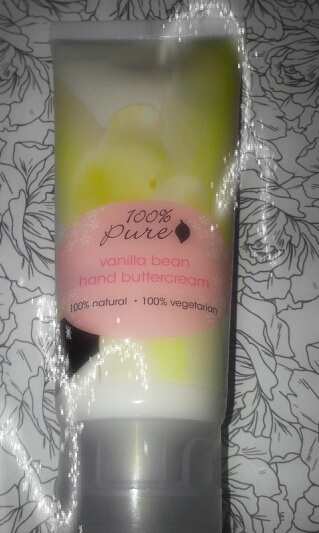 I picked out a 2 fl oz container of Vanilla Bean Hand Buttercream. Oh my goodness! This stuff smells amazing. It smells like……dessert! I think I want to marry it. If you look at the product on the website, check out the reviews and you will see that many people agree! All of their products are 100% natural, and standard shipping is always free! Check them out! I did also purchase a few other products but haven’t tried them out yet! I am sure they will be great though!